Non-Asbestos Gasket joint sheets is fabricated by the dealers using best quality raw material in complaisance with the international standards. This gasket jointing sheet is highly renowned for its rugged construction, reliable performance and longer service. We offer Non Asbestos Gaskets which are gaining significance due to the known hazards of asbestos made products. We offer a wide range of proven Compressed Non Asbestos Gaskets with high fluid media in addition to a few special applications. 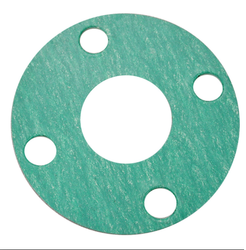 Non-Asbestos Sheet gaskets is made of high quality non-asbestos fabric and synthetic rubber and its sealing ability is exceptional and safe against oil and its usage is suitable for where that asbestos cannot be used. The heat resistant discs are made from materials containing a higher percentage and a small quantity of organic binder. Recommended for making up a solid block of supporting internal and external rollers in steel & glass plants. The discs possess adequate physical strength to withstand the machining operations to achieve a mirror finish. 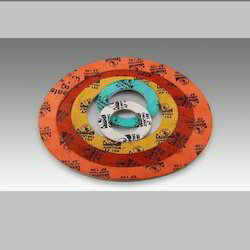 In order to fulfill the diverse requirements of our clients, we are engaged in offering compressed non asbestos fiber gaskets. We in our Port Folio have range of Non Asbestos Gaskets starting at Lower end from Rubber Natural / Synthetic to Gaskets from Sheets composed of Synthetic Fibres & Synthetic Rubber Binders to Gaskets from Graphite in Higher end. Two Wheeler Gaskets Supplier in Delhi & India. We have complete range of Non-Asbestos Products which is a compulsory mandate for all ISO Standard Companies.